See how Christ’s fulfillment validates God’s Word, and affirm your faith in Jesus as our Messiah! 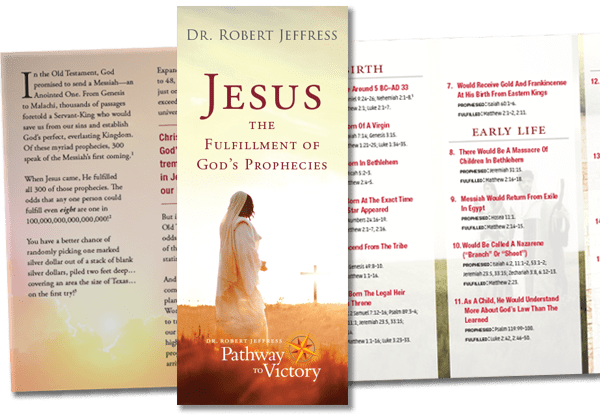 Highlights 37 of the more than 300 prophecies fulfilled by Christ’s first arrival. Includes Scripture references for promises prophesied and fulfilled. Offers solid Biblical knowledge and understanding that you can share with others this holiday season! Please fill out the form below, and we will mail this complimentary resource to you! Currently, Pathway to Victory can only ship products inside the United States. Please contact our webmaster via email if you desire to make a donation from an international territory and receive a product.